This standard mobile restroom has white washable walls, black rubber flooring, black counter tops, and has heat/AC, running water and flushing toilets and more. Vacant and occupied lights on exterior of trailer. LADIES MOBILE RESTROOM: Private suite with toilet, sink and vanity. GENTLEMEN MOBILE RESTROOM: Private suite with toilet, urinal, sink and vanity. recessed lighting, crown molding, white cabinetry, wood grain floors and dark counter tops. Vacancy lights, stereo system, exterior courtesy lighting and much more. LADIES MOBILE RESTROOM: Spacious suite with a toilet, sink, mirror and vanity. MENS MOBILE RESTROOM: Private suite with toilet, urinal, sink and mirror/vanity. recessed lighting, crown molding, dark wood cabinetry, light color wood grain floors and light tan surface counter tops. The Deluxe has 2 Private Mobile Restroom Suites with 2 Stalls. Interior: the Deluxe is a high-end unit finished with woodgrain floor, recessed lighting, crown molding, wainscoting and more. Stereo system, exterior courtesy lighting and much more. 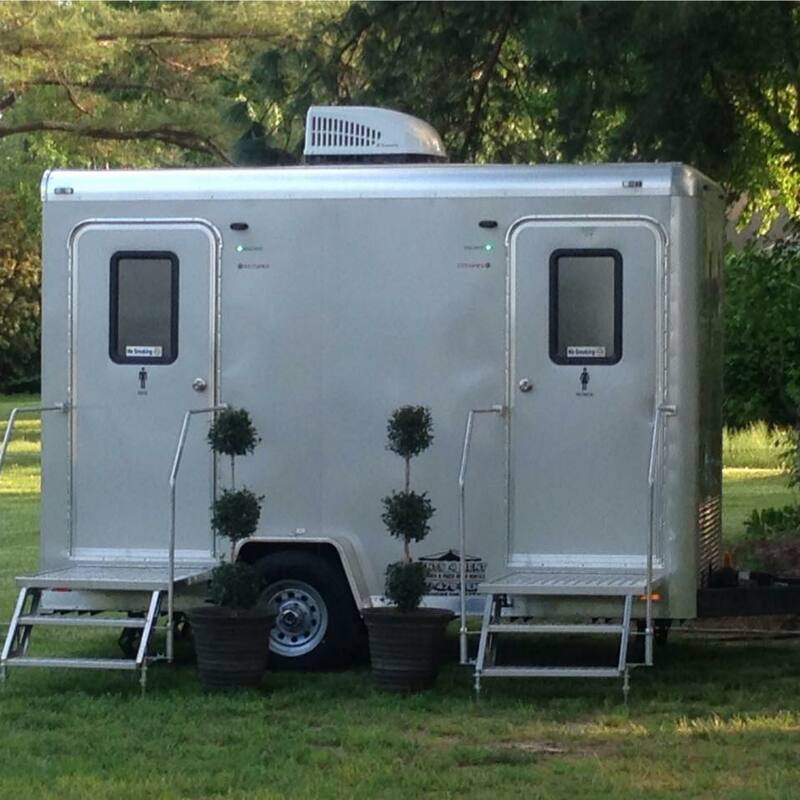 LADIES MOBILE RESTROOM: Spacious suite with 2 private toilet stalls, a sink, vanity and mirror. MENS MOBILE RESTROOM: One private stall with a toilet, one urinal in a private cove, a sink and mirror/vanity. Interior: The Country Charm is finished with a rustic barn wood interior, wood grain plank floors, dark brown counter tops and other rustic touches. It has an upscale yet rustic feel. Interior: The platinum is finished with 2 shades of gray walls, wood grain plank floors, dark gray counter tops and white cabinets. It has a very modern feel to it. Interior: tan walls with white wainscoting, crown molding, recess lights, brown counter tops, and wood grain floor. 2 LADIES MOBILE RESTROOMS: Toilet, sink, bathroom mirror and vanity. 1 MENS MOBILE RESTROOM: Toilet, urinal, sink, vanity and mirror. Interior: The magnolia is finished with a shiplap backsplash, gray walls and white trim, wood grain plank floors, white counter tops and cabinets. This trailer has a very modern feel to it.